A large international project like Herschel requires a lot of meetings so that things can be properly coordinated. I’m currently at a consortium meeting for the SPIRE instrument team. The meeting is in Padova, where the university’s astronomy department is overlooked by the observatory used by Galileo – I suspect this must be more than a little intimidating for students there! The SPIRE team is actually too big for the meeting rooms in the astronomy department so we’re meeting in the nearby department of theology, which seems to have larger and nicer facilities than the astronomers! Apart from discussing various instrumental issues, such as calibration, pointing accuracy, performance and subsystems, we’re also getting reports from the various science teams that are using the instrument team’s guaranteed time on Herschel. It’s only about 6 weeks since the ESLAB meeting where the first Herschel science results came out, but there’s already lots of new stuff on its way. The preparations for ESLAB, and its associated science papers, was a bit frenetic. We’re now able to sit back and take a rather more measured approach to these new results. So there’ll be no new big explosion of results, but we’ll be releasing longer and rather more extensive papers in the next phase. Needless to say we’ll try to cover as many of these as possible on this blog! This afternoon has been hopping from nearby to more distant galaxies. I’m more interested in the latter, so payed close attention to the talk on H-ATLAS, a project I’m working on which is the largest single survey being conducted with Herschel in terms of area. We’re also getting a talk now on the PEP survey which is producing the deepest images obtained with the PACS instrument, probing the origins of the cosmic infrared background. Astoundingly deep and high quality images – hopefully some of these will be released on Thursday – compared to what has gone before. The Herschel Heritage survey aims to look at the links between dust and star formation processes with detailed studies of the Milky Way galaxy’s nearest neighbours – the Large and Small Megallanic Clouds. These are two dwarf irregular galaxies that orbit around our own galaxy, and are thus ideal laboratories for looking at galaxy scale processes. It’s difficult to do this in our own galaxy because we’re inside it, and thus can’t clearly see how it is structured. For their Science Demonstration observations Heritage obtained a scan across the centre of the Large Magellanic Cloud. The cool dust revealed by Herschel can then be matched to observations at other wavelengths with, for example, the Spitzer satellite, that reveal other constituents of the interstellar medium in the LMC. From this image we can see several things. Firstly, stars are generally found away from regions of cool interstellar dust. 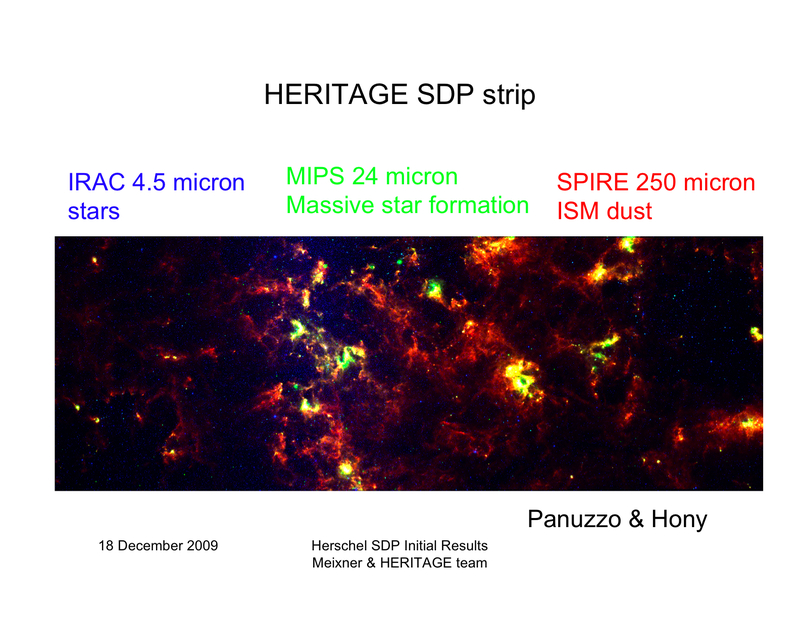 Secondly, dust and massive star formation are frequently associated. However, some large clumps of dust do not have attendant star formation. Why is this? Are these regions pregnant with potential young stars awaiting some yet-to-be-identified trigger, or is there some ingredient missing in them that’s preventing star formation? Further observations with Herschel, and especially spectroscopy which will allow the determination of the detailed properties of the gas in these various different clumps, should answer this question. Over the next several weeks we’re going to be saying a bit more about the various Herschel first science results that were discussed at the meeting in Madrid just before Christmas. These are very early results that have not been fully digested or understood, but they give a taste of what is to come once these various projects collect many times more data on their targets and the scientists working on them have had more time to understand the results. 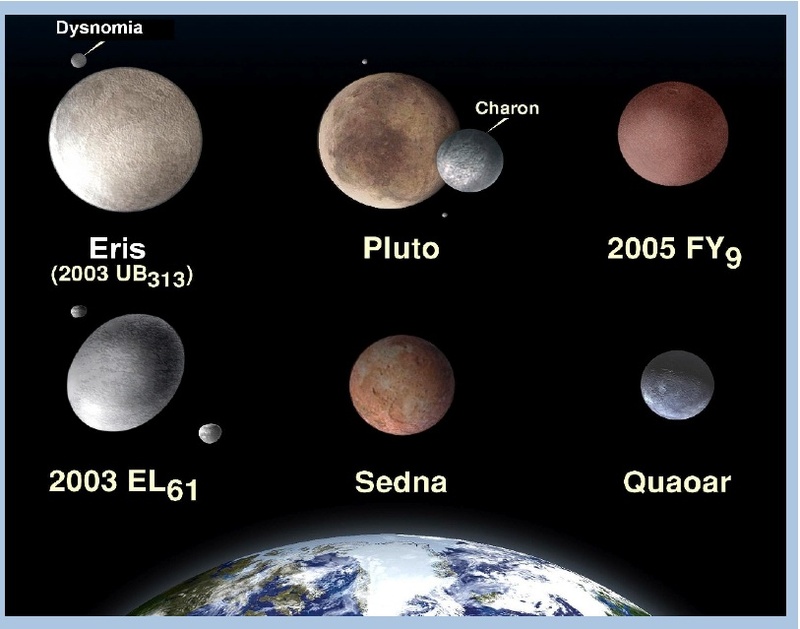 The first set of new results we’re going to discuss are observations of Trans-Neptunian Objects – dwarf planets at the edges of our own solar system like Pluto, Makemake and Eris. My field is extragalactic astronomy and cosmology, so my professional work doesn’t usually involve such things, but I do find them interesting on several levels. Firstly, they’re the most distant objects in our solar system and the least affected by the Sun, so they’re the closest thing we have to the very earliest objects to form around the Sun. Secondly, they’re so distant that they could be thought of as being on the edge of interstellar space – they are, in a sense, the boarder guards of the solar system. Finally, and this isn’t really a scientific point, I’m working on some science fiction set in trans-Neptunian space and beyond so any new results have a bearing on what I’m going to write. What has Herschel seen of TNOs? So far a handful have been observed with the SPIRE and PACS instruments. The aim is to better understand their basic properties – size, mass, albedo – by measuring the amount of far-IR light that they emit. Since they’re small, maybe 1000km in diameter, distant and cold, they are very faint and require a large telescope like Herschel for them to be detectable. The second picture shows what PACS saw when it observed Pluto. This is a ‘differencing’ observation, where the target is observed in one position on the detector, then moved to another and the two are subtracted. This process is repeated several times so you see a positive image at the centre and other positive and negative images at the reference positions. PACS observed six TNOs, including Pluto. Two were fainter than predicted based on what we thought we knew about them, one was significantly brighter and three were about right. Meanwhile two TNOs were observed by SPIRE and here too things weren’t quite what was expected. What does all this mean? We don’t know just yet, but since the results aren’t quite what was predicted we’re clearly learning something new about these objects. They might be more reflective – have higher albedo – than we thought, their surfaces might be more rocky, or their sizes might not be what is expected. As with all the data we’ve seen from Herschel so far, there’s a lot more work to be done before we understand what the telescope is telling us. But it’s clear that Herschel is going to bring new light to our own solar system along with the rest of the observable universe! Lots of new Herschel science will be released over the next few days by ESA. The first new result is an image of a region in Acquilla (not the Eagle Nebula as I originally stated – apologies!) taken with the PACS and SPIRE instruments. The Eagle Nebula image reveals the dust and young stars obscured from observation by telescopes, such as HST, working at shorter wavelengths. Much structure is seen in this image, revealing the complex turbulent interactions behind star and planet formation. More images and science results are coming. There should be several more releases over the next few days, coinciding with the early Herschel science meeting currently underway in Madrid (I’m not there so can’t report live). 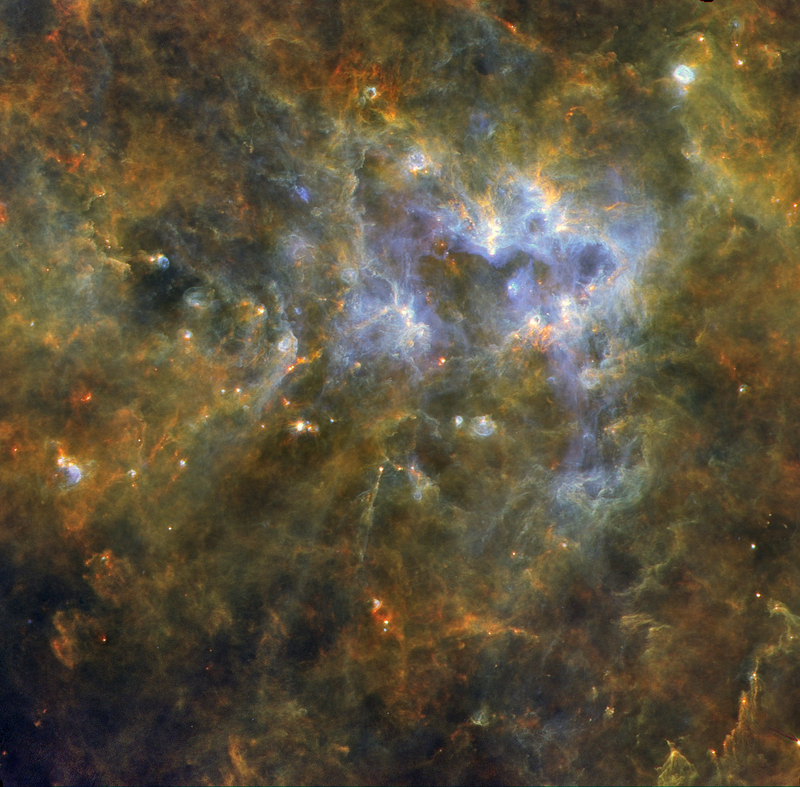 ESA have set up a central resource for all new Herschel images – the OSHI – online showcase of Herschel images. There’s not much there at the moment, but it’ll soon be filling up! 2pm GMT is when STFC will announce its prioritised programme in astrophysics, particle and nuclear physics. What this effectively means, since they need to find ~£70M in cuts, is that this will be a cut list. By then end of today there will be far fewer projects in these fields, and probably far fewer people with jobs in them. STFC is calling this exercise ‘Investing in the Future’ because they have to keep their political masters happy and because the people in charge haven’t got the backbone to admit the whole thing is cocked up. Keith Mason, the Chief Executive and an ex-X-ray astronomer (I can’t see any university department wanting to have him back), especially has been wholly craven in his stance on these cuts, going so far as to say this tis is good for the affected fields. I know the first job at STFC that I’d cut. There is more discussion of today’s devastation in blogs and newspapers. It is especially ironic that this is all happening on the same day that Herschel will announce its first full scientific results. Herschel has been an astounding success for UK science, both because the UK is the world leader in far-IR/submm astronomy, but also because we’ve led the construction of the SPIRE instrument which is performing superbly. But it is far from certain that the UK Herschel programme is going to survive today. 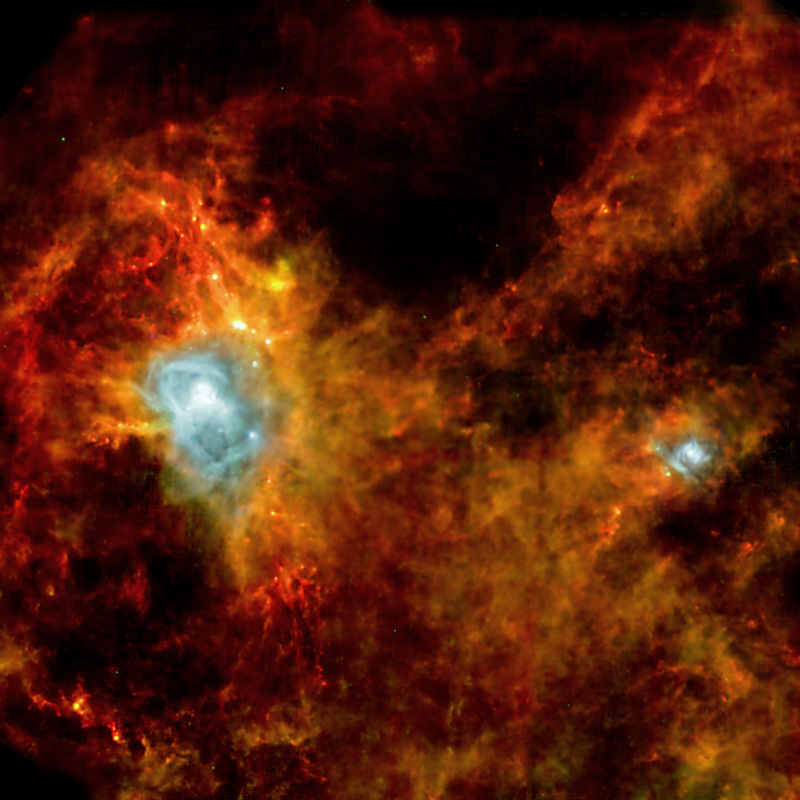 ESA put out a major release today showing the first results from the spectrographs on Herschel. The release includes data on the Orion star formation region, on nearby and distant galaxies, on a massive star about to become a supernova and on a comet in our own solar system. The latter set of data was taken with HIFI before the technical fault that has left it shut down, awaiting a restart early next year. These spectroscopic observations show the huge potential of Herschel to show us the physical and chemical processes going on inside dusty objects, be they star formation regions in our own galaxy, or in luminous interacting galaxies like Arp220 and Mrk231. 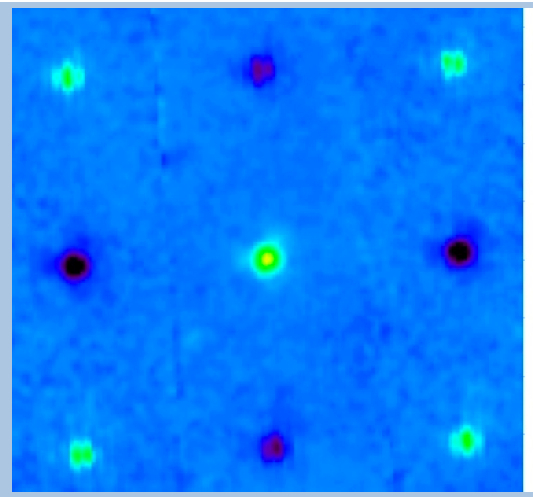 My own research interests are more focussed on the distant luminous objects, and the data shown here from two archetypical ULIRGs (Ultraluminous Infrared Galaxies) are really spectacular. Never before have we seen the rich range of spectral lines that PACS and SPIRE have revealed in these objects. PACS also holds out the hope of examining the velocity structure of some of these lines. This is particularly interesting in Mrk231 which hosts not only a massive burst of star formation but also a supermassive black hole powering a hugely luminous active galactic nucleus (AGN). 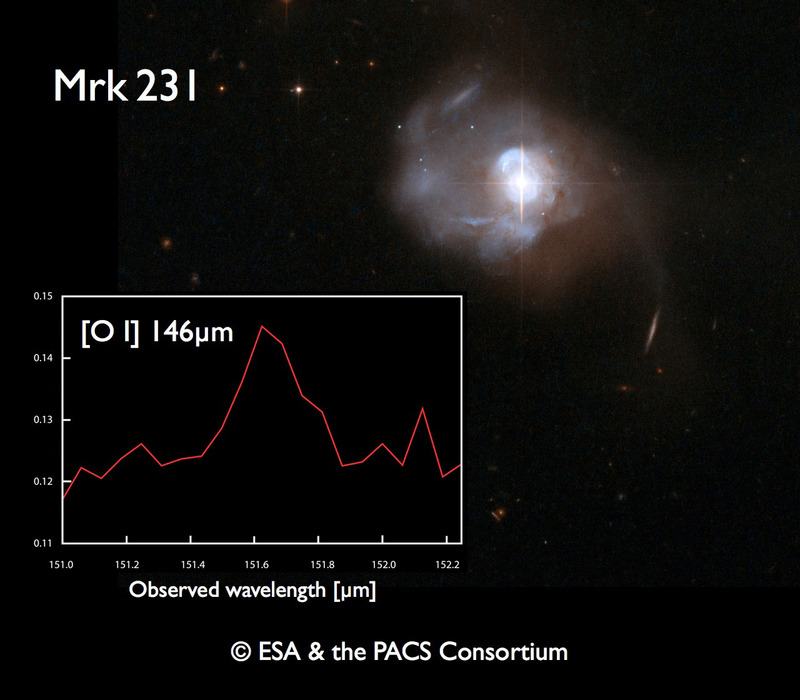 The relationship between galaxy interactions and mergers in triggering both starbursts and AGNs is a hot topic, and Mrk231 makes an ideal testbed. 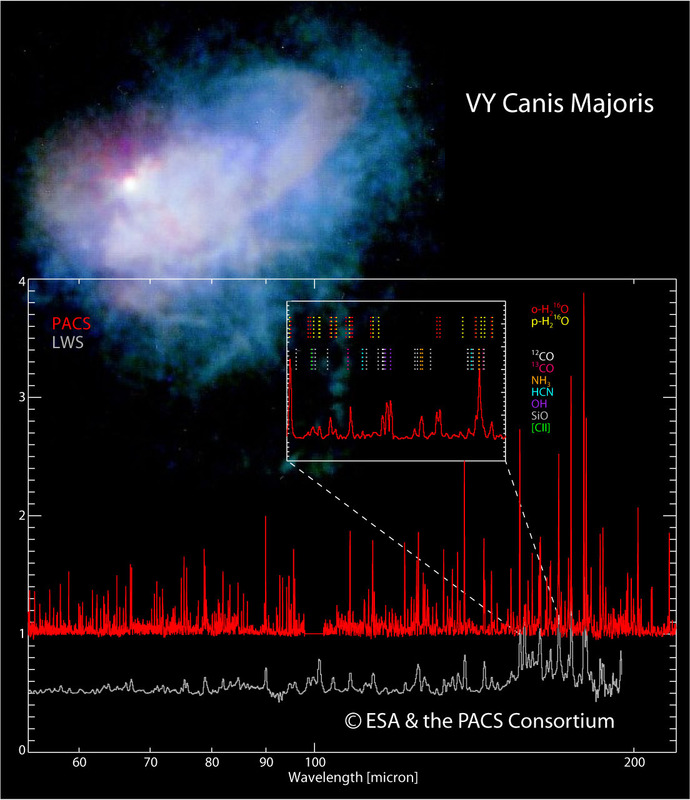 Finally, for sheer spectral richness and complexity, the PACS spectrum of the massive star VYCMa takes some beating. There’s a huge amount of physics and chemistry in this spectrum of a star deep into its old age and soon to become a supernova. Unfortunately this isn’t my area, so hopefully someone will add comments describing what the data means for this object. For more information and coverage of these results see the ESA web release, BBC News Online, and the SPIRE website at Cardiff University. On Wednesday this week and next week you can get an insight into the workings of a space mission. BBC radio 4 are broadcasting a two episode series called The Herschel Space Telescope about the development and launch of the satellite. Many of those responsible for Herschel and the SPIRE instrument will be featured, possibly even me. The first show is at 11am on Wednesday 18 November, and the second show a week later. Hopefully those who miss it because they’re at work (like me!) will be able to catch it on Listen Again. For more information see the BBC webpages for the show. ESA released new images form the Herschle telescope today. This shows a two degree square region of our galaxy at wavelengths and resolutions that have never before been achieved. The images show intricate filamentary structures made from cold interstellar material. This matter feeds galactic star formation, and this image provides new insights into these highly turbulent processes. This is also the first image released from Herschel’s ‘parallel mode’ that allows it’s two imaging instruments, PACS and SPIRE, to work together. This observing mode is immensely powerful as it allows 5 colour images such as this to be produced which might otherwise have had to be pieced together from separate observations. It’s a critically important mode for many of Herschel’s large area surveys, including the HIGAL project which will observe the entire galactic plane with sensitivity and resolution matching the 2 degree by 2 degree image shown here. 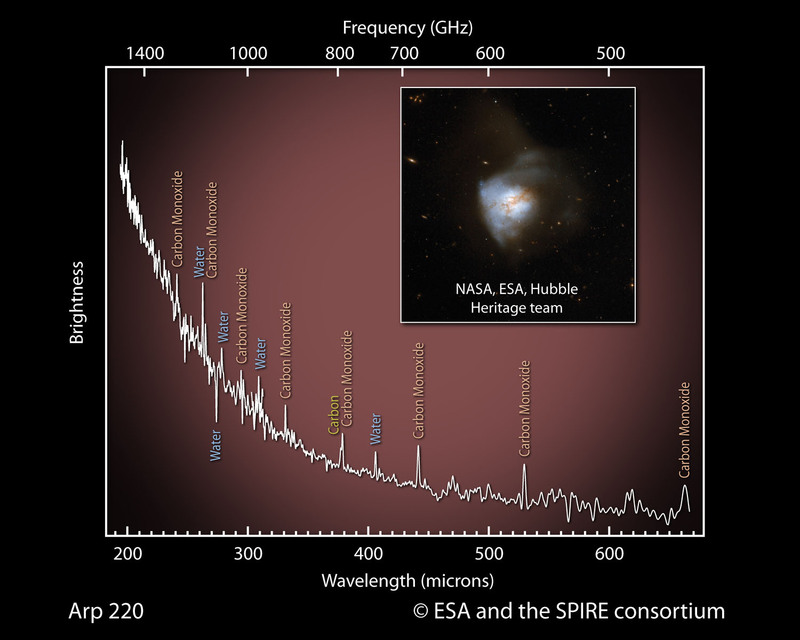 Further information about Herschel can be found from ESA, the SPIRE instrument team, the UK’s STFC and the BBC.